Wells Fargo used to be able to brag of a superior reputation, rich in history, and mostly clean of the mud from the Great Recession. But over the past two months, the storied Wells Fargo name has been tarnished by a scandal. And unlike complex financial crisis-era crimes, this is one all Americans can understand. 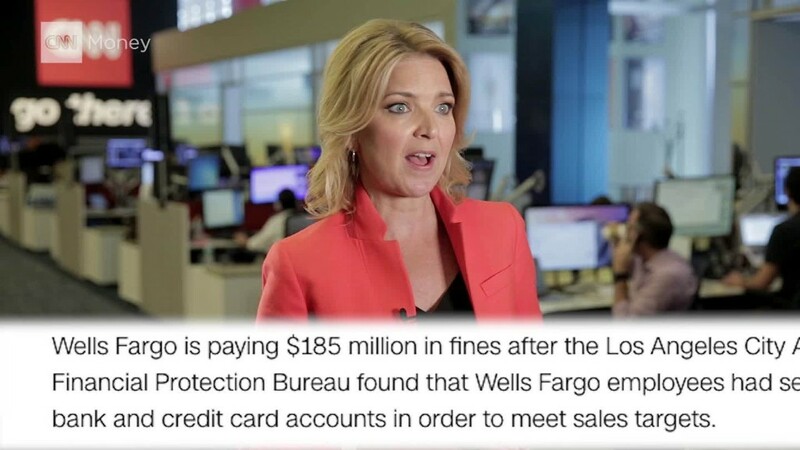 Wells Fargo created as many as 2 million fake bank and credit card accounts between 2011 and 2015. The bank's fumbled response in front of Congress, and alarming stories of mistreatment by workers, have only added fuel to the fire. Now there's evidence that the scandal has inflicted serious damage on the Wells Fargo (WFC) brand. Negative perceptions of Wells Fargo have soared to 52% from 15% before the scandal, according to a survey of 1,500 bank customers conducted last week by management consultancy firm cg42. Positive perceptions fell to 24% post-scandal from 60% beforehand. More concerning, just over half of non-Wells Fargo customers surveyed say they are unlikely to join the bank, compared with 22% previously. The results "paint a bleak picture" for Wells Fargo and suggest the "full financial impact of the scandal is yet to be felt," cg42 wrote in a report on Monday. 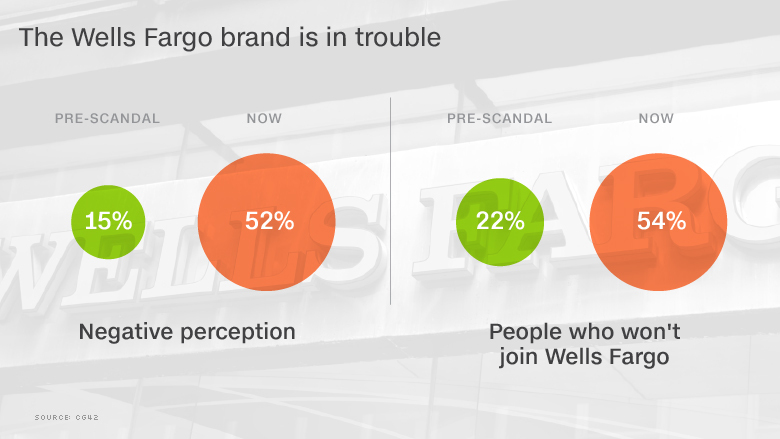 Even though only 3% of the Wells Fargo customers surveyed said they were impacted by the scandal, 30% claim they are actively exploring leaving the bank, the survey said. So far, 14% of Wells Fargo customers surveyed say they have already decided to switch banks due to the fake account scandal. Based on cg42's analysis, Wells Fargo is at risk of losing $99 billion in deposits over the next year and a half "as a direct result of the scandal." If that many customers decided to flee, it could wipe out $8 billion of Wells Fargo revenue, the firm said. Wells Fargo currently has a total of $1.3 trillion in deposits from customers. "The short and medium term outlook for Wells Fargo is gloomy," cg42 wrote. "The fallout from the scandal will impact the bank's bottom line for years." Early results from the bank suggest there already has been an impact. Wells Fargo said new account openings and credit card applications plunged by 30% between August and September. Mortgage referrals from the retail bank declined by 24%. (The settlement with regulators was announced on September 8). "We're prepared for things to get worse before they get better," said CEO Tim Sloan, who took over after longtime chief John Stumpf suddenly resigned under great scrutiny. Part of the problem, according to cg42 founder Steve Beck, is that Wells Fargo customers have for years said their No. 1 frustration was being pushed to sign up for products they don't need or want. In other words, the news of the past two months only confirms those complaints. Some Wells Fargo customers who reached out to CNNMoney expressed dismay over the fake accounts. Jeanne Young of South Amboy, New Jersey said she closed her Wells Fargo checking account and refinanced her mortgage away from the bank after receiving a credit card she never asked for. "I was livid about the whole thing. I don't trust them," Young told CNNMoney. "There's no doubt in my mind it was deliberate." One anonymous Chase customer surveyed by cg42 echoed this concern. "If I can't trust them to have my best interests in mind, how can I trust them with my money?" Some Wall Street analysts don't believe the customer losses will be all that dramatic. Mike Mayo, a bank analyst at CLSA, said he informally surveyed Wells Fargo customers and found that most of them were content and had multiple products with the bank. "You're going to have some dislocation, but the existing customer base is incredibly sticky," Mayo said. "Sticky" means customers aren't likely to go through the hassle of switching banks. Wells Fargo declined to comment directly on the report, but a spokesman pointed to recent metrics that show a more muted response from existing customers. For instance, Sloan said that primary consumer checking customers rose 4.5% in September and customer traffic to branches remained at "typical levels." Any Wells Fargo customer defections could create a big opportunity for its rivals. Community and regional banks have the most to gain, with cg42 projecting they could enjoy a deposit influx of $39 billion. Bank of America (BAC) and Chase, the other two mega banks in the U.S., should also benefit from Wells Fargo's troubles.